Your pattern is a real hit!!!! I will be reading this post for sure even if I can't start this quilt just now. 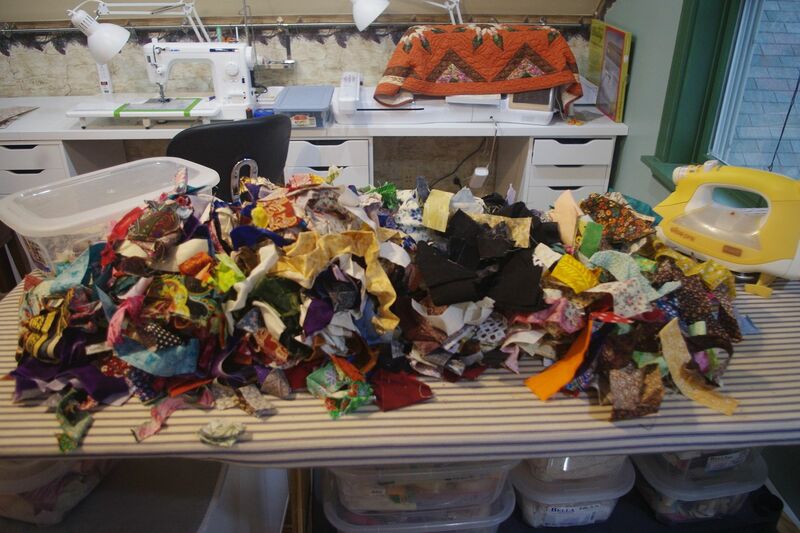 I am working (very slowly) on 2 reversible quilts right now, plus, I do not have enough strings yet. I am so interested in this pattern but holding my hands in my back to make sure they do not start another quilt before I finish those that are in progress.. Yesterday I managed to cut my 180 (4 1/2” X 8 1/2” ) foundations and all 180 center triangles. I might manage to make a couple blocks today. I really need to get the quilt that’s loaded up quilted and I have a hockey quilt prepped ( jerseys all deconstructed) ready to start quilt construction— those two have to come before really diving too far into this project. But I can take the time to put one or two together & see how it goes. Please count me in too. Made the triangle template and made one block to see how it would go. Already have my strings, a year or so ago I got fed up (read overrun) with my scrap problem so I took the time to just cut them into strips, didn't really measure just eyeball cut. I had already sorted all scraps by color so keeping the strings/strips color coordinated was easy. I just stuffed them into zippered bags. ( I have a tiny OCD problem about some things). Have cut all but 20 or so of the 8.5 x 4.5 foundations, and when I get the triangles cut, watch out. Cathy, when I do string blocks, I set up an iron and board next to my machine to press as I go. If any of my strings are too wrinkled, I give them a quick press as I use them. You may save yourself some time by just sorting now and ironing the strips as you go. Just an idea. Can't wait to see everyone's version of this pattern. Is there a way to have all the comments show up without me having to hunt each day? I read this all the time but don't know how to use all the nice features! I've got them all pressed and sorted. I sorted out all the solid black and have them set aside. My problem - after looking over the tutorial, this method is too similar to another major project I'm working on right now (basically a lot of strip paper piecing) and I'm looking for something to do when that gets too tedious. But now that I have these all pressed and sorted, I really do want to use them in something . . . I think I could modify the method and do them without paper, just make angled strips and then sew them into rows with the triangles in between. Getting ready to cut my black triangles. Is there a quick method? Has anyone changed it up to use a triangle ruler? It seems like that would be quicker. If you have a Tri-Rec ruler, it has the correct dimensions. And if not, it's real simple to cut a template using the measurements. The tri rec is about a 54 degree angle, so unless you have one specifically for cutting a triangle with the base the same as the height, the angle will not be the same. If you go with a 45 degree angle, you're going to get a slimmer diamond shape and loose a lot of the look. If you got 60 degrees, you'll get a square instead of the diamond, and I think the elongated diamond is what makes this so interesting looking. I looked around at pictures of string quilts, and decided I like this pattern the best. I think it's going to work very well with the string selection I have. And now that I know the angle, I can sew and then cut out my shapes. Lots of rather mindless sewing, which is exactly what I'm looking for. Last edited by Macybaby; 03-20-2018 at 05:30 AM. I was also thinking of using a 45 degree triangle ruler - thought it might be quicker for me . I'm hoping to get organized and started by Friday. I am in but my start will be delayed. I had bookmarked the tutorial and put it on my "to do" list. No lack of strings or scraps that can be used as strings. What color for triangles? Hummmmm, I may need to check the stash to see what I have a lot of. I may go with that rather than black but I love the pop of black in my work. Decisions, decisions, decisions! Thanks - I will experiment with my tri rec. I haven't used it much - I think one time with a Bonnie Hunter quilt. Really appreciate you input. At the top of this page, you should see a tab called "Quick Links". Click on that, and then on "Subscribed threads". That will take you toa list of all the topics you have commented on, with most recently commented ones at the top. Find this thread (or whatever one you want to read) and click on the grey circle/triangle thingy to the left of the thread title. That will take you immediately to the first unread comment in the thread. You can read from there to the end, then check back another day and find everything new since last time you read it. side (skinny) triangles: 90, 26.565, and 63.435 degrees. center (wide) triangle: 63.435, 63.435, and 53.130 degrees. a 60-60-60 degree triangle with the same base length as the triangle in a square triangle will be "shorter"
Would a Kaleidoscope ruler work? I think is is 45 degree (isosceles triangle) and allows a variety of sizes. Congratulations on a fabulous quilt! You've inspired lots of quilters on QB. Everyone is encouraged to post pictures so we can all 'ooooo' and 'aaaahhh' over them. I'm going to make a few blocks later today & will post some pics. Here's what I have so far. 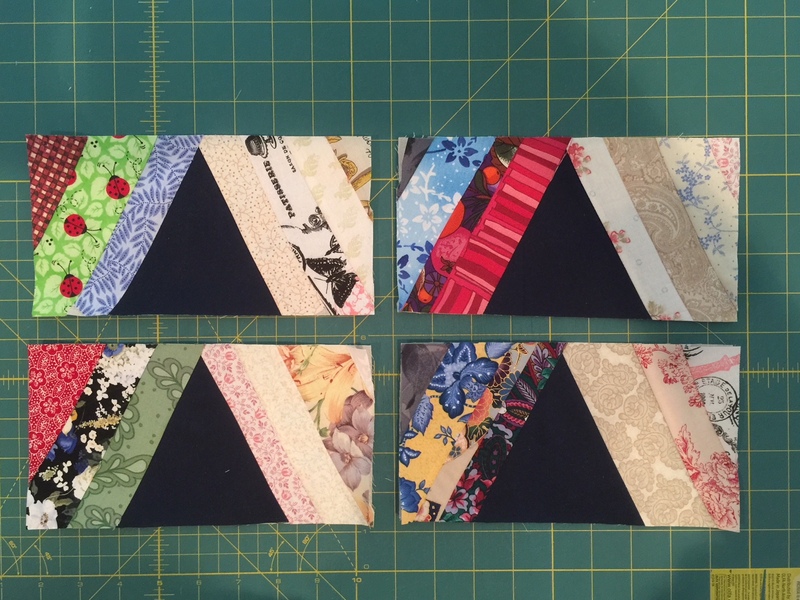 I decided to go with the Navy blue for my triangles b/c I had a lot more of it. I'm also using muslin for my foundation. So far, it's working well. Let's see some other pics!! I recently saw a great idea for cutting triangles without the need for a 'special' ruler. Cut a template from thin card and stick it onto a ruler with one of the sides of the triangle at the edge of the ruler. This is the edge you will always use to make your cut. Ideally, use a ruler that's not too much bigger than the template so as to make it easier to handle. 6"sq or 12"x6" etc in this case perhaps. Now use your template as you would normally to cut triangles from a strip of fabric, but because it is stuck to the ruler you have the edge to cut against. If you see what I mean. For each triangle you just turn the template so the base of the triangle is either at the top or bottom of the strip, turning the ruler over each time. This is much harder to describe than do I'm afraid, but once you get the template stuck onto a ruler I'm sure you'll see how this works. I'm not sure where I saw this method. If it was from anyone on here, I'm sorry for not acknowledging you. I fold my fabric four layers thick, trace around the template, and cut them with my rulers. I'm in! Started this as soon as the tutorial was posted. I have plenty of neutral skinny strings but not enough colored skinnys. So....I came up with the idea of taking several of my scrap strips, sewing 4-6 of the same width strips together , tube style, then slicing up the centers of the strips. Instant skinny strips with 2 of them already sewn together. Lots of variety if you have lots of short strips that are just too wide for this string pattern. Looks like a fun quilt for scraps. I'm thinking.